Houseclass returns to CDLC Barcelona in May, running weekly from Thursday the 1st until 4th September with a special Frankie Knuckles memorial. The Barcelona events series ran for the first time last summer, playing host to a strong line-up of classic house DJs. 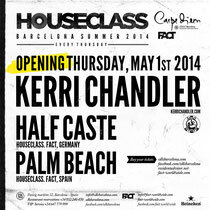 The premise is much the same in 2014, with Kerri Chandler booked to oversee the opening party. Todd Terry will play the following week, with Kenny Dope spinning on the 15th. South Africa's Black Coffee will present a different perspective with a set on the 22nd, before Chicago's Mark Farina arrives on the 29th. DJ Pierre and DJ Sneak will also put in appearances across the summer, as well as Sandy Rivera, Harry Romero, David Morales and many more. All parties will run from 11:30PM through until 6AM. Check the full line-up below.